VIENTIANE - The yellow-spined bamboo locust outbreak is expanding in northern provinces despite the best efforts of surveillance teams at central and local level to control the insects with chemical spraying. The locust population currently is expanding in 750 locations, involving 309 villages in 24 districts of five provinces, according to an Agriculture Department report. Crops including sweet corn, cassava and rice have been destroyed by the insects with the damage expected to affect more than 9,000 hectares. 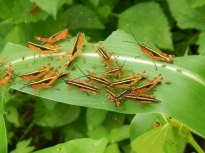 Luang Prabang province has recorded yellow-spined bamboo locust outbreaks in 428 locations involving 196 villages of eight districts across an area of 3,000 hectares, while 325 hectares or 133 sites in 67 villages have competed spraying to destroy the insects. Phongsaly province found 72 locations in 25 villages of three districts affecting around 155 hectares, of which 144 hectares or 71 sites in 25 villages have completed spraying. Huaphan province discovered 171 locations in 71 villages of eight districts involving an area of about 566 hectares, with 158 hectares or 78 sites of 38 villages having been sprayed to prevent an outbreak. Xieng Khuang province recorded outbreaks at 62 locations involving 14 villages of three districts with a total area of 175 hectares, of which spraying has been completed on 128 hectares in 43 sites of 11 villages. Meanwhile, Oudomxay province found 17 locations in three villages of two districts over an area of 35 hectares, of which 19 hectares in 15 sites of three villages were sprayed. The surveillance teams are keeping other districts of these provinces under close surveillance especially on the lookout for young emerging locust populations. Many locations cannot be accessed to spray due rugged terrain while some areas have used to slash and burn techniques to destroy the insects to prevent chemicals entering local water resources used by villagers and livestock. To further respond to the outbreak, teams at each level will continue spraying swarms where they are found to reduce the yellow-spined bamboo locust population. This year, agricultural authorities proposed funding of 11 billion kip from the government for the project but this figure is under review by the relevant sector. Previously, authorities received welcome cooperation, technical assistance, equipment and some funding from the Food and Agriculture Organisation of the United Nations and the government of China. However, further cooperation is needed to help farmers earn an income and with food security.